AN AFRICAN FIRST. A tiny nation in Africa is ready to take a big biotech gamble. On Wednesday, researchers announced that they’d gotten the go-ahead from the government of Burkina Faso to release genetically engineered mosquitoes into the wild. 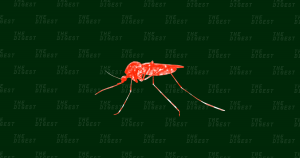 The move is part of a long-term plan to eradicate a malaria-transmitting species. This will be the first release of any genetically modified animals into the African wild (genetically modified mosquitoes have been released in the wild elsewhere). MALEVOLENT MALARIA. Malaria spreads when parasites infect mosquitoes, and those insects then transmit it to humans. According to the Centers for Disease Control and Prevention (CDC), 445,000 people died from malaria in 2016, and most of those were children in Africa. If we can get rid of that particular type of mosquito — or at least decrease its numbers — we should be able to reduce the number of malaria cases and deaths. The mosquitoes the researchers plan to release in the Burkinabé village of Bana this month will be males genetically modified to be sterile. These mosquitoes aren’t intended to eradicate malaria — they’ll be there to help locals trust the scientific community. THE ULTIMATE GOAL. If they’re able to meet that goal, researchers in Burkina Faso, plus the African nations Mali and Uganda, hope to later release “gene drive” mosquitoes into the wild. Unlike the mosquitoes approved by the Burkinabé government, those mosquitoes will have been genetically altered to carry mutations intended to thin the population that they’ll pass down to all of their offspring. No one has ever released a gene drive-modified animal into the wild, and for good reason: it’s very risky. If the release of these genetically modified sterile mosquitos produces some unforeseen consequences, we can simply wait for all the insects to die. Once we release gene drive mosquitoes into the wild, though, we don’t really have an “undo” button. But given the number of malaria-caused deaths, the risk just might be worth the potential reward. More on mosquitos: Scientists Could Eradicate Malaria by Altering Mosquitoes DNA, but Should They?